Enjoy the half day tour to Bhimtal Lake- it is a lake in the town of Bhimtal, in the Indian state of Uttarakhand. It is the largest lake in the only real lake district of India. It is a perennial lake which not only supports a large variety of aquatic life but is a winter stopover for Trans Himalayan birds and later proceed to visit Sattal Lake - Sattal or Sat Tal (Hindi for "seven lakes") is an interconnected group of seven freshwater lakes situated in the Lower Himalayan Range near Bhimtal, a town of the Nainital district in Uttarakhand, India. 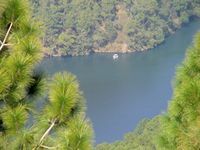 During the British Raj, the area had a tea plantation, one of four in the Kumaon area at that time.The lakes sit at an altitude of 1370 metres below lush orchards in the Mehragaon valley.